Classes used for rendering raster data, accessing and rendering image services, as well as accessing and rendering Web Coverage Service (WCS) services are located in the Carto library. Raster data consists of a rectangular array of equally spaced cells, which taken as a whole represent thematic, spectral, or picture data. Raster data can represent everything from qualities of a land surface - such as elevation or vegetation - to satellite images, scanned maps, and photographs. A raster dataset represents one or multiple arrays of pixels as well as associated information that is stored as a particular raster format in a storage media, such as a file system or a geodatabase. A raster catalog is a special type of feature class that can store both the footprints of raster datasets and the raster datasets in geodatabases. 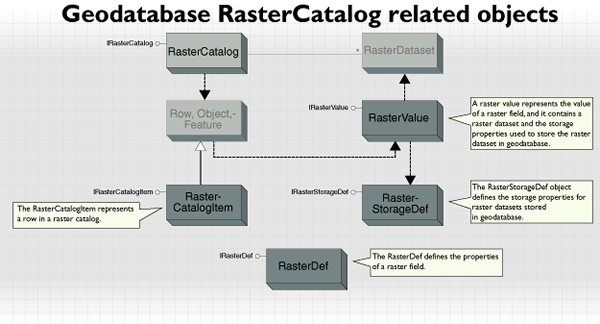 The raster catalog data model is used to manage a collection of raster datasets. A mosaic dataset, introduced at ArcGIS 10, is used to manage rasters from various raster formats and multiple sensors and to provide a mosaic view of the data. A raster dataset consists of one or more raster bands. Each band in a dataset can contain the statistics and histogram of the pixel values. A raster dataset can also contain pyramids, a stack of down resample pixels stored in the dataset and used for fast display of large raster datasets, statistics of the pixels, and many other properties. A single band raster dataset can contain a color map consisting of a set of colors (red, green, blue [RGB]) used in displaying the pixels, and a raster attribute table that stores additional information about the pixels, such as land use or soil type. As a type of geodataset, a raster dataset can contain a geodata transformation and a spatial reference. The geodata transformation defines how the pixels are transformed during access, and a spatial reference defines the coordinate system of the pixels to which they are mapped. If the pixels or cells of a raster dataset have missing information, those cells are called NoData cells. A file-based raster dataset uses a NoData value to represent NoData, while a geodatabase raster dataset uses a bit mask to represent NoData. A Workspace object is a repository that stores geodatasets. For raster data, a Workspace can be a raster workspace (or a directory) for file-based raster data, an Access workspace for raster data in a personal geodatabase, a file geodatabase workspace, or an ArcSDE workspace. 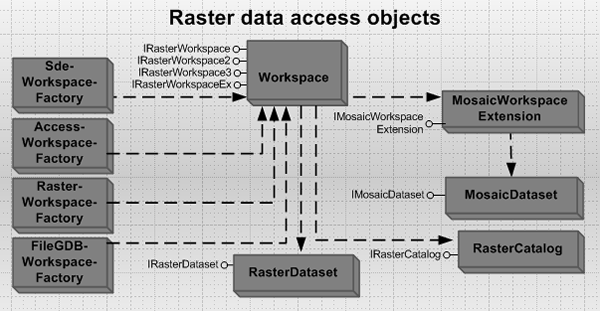 To access raster data, create a workspace, then use the IRasterWorkspace2 or IRasterWorkspaceEx interface. The following functions create workspaces from difference sources. These functions are referenced throughout this topic. //Open a raster dataset from a file system. 'Open a raster dataset from a file system. //Open a raster catalog from a file geodatabase workspace. //Open a raster dataset from an SDE workspace. 'Open a raster catalog from a file geodatabase workspace. 'Open a raster dataset from an SDE workspace. The RasterDataset class represents a raster dataset stored in a storage media, file system, geodatabase, or in memory. RasterDataset is a file raster dataset if it is opened from a file system or a personal geodatabase, and it is a database raster dataset if it is opened from a file geodatabase or an ArcSDE geodatabase. A raster dataset in an unmanaged raster catalog, where raster datasets are stored in a file system, is also a file raster dataset. ArcGIS allows you to create an in-memory RasterDataset where the pixels are stored in memory. This type of raster dataset has the characteristics of a file raster dataset. A file raster dataset and a geodatabase raster dataset behave the same except for some minor differences. Creating raster datasets in various workspaces requires specifying the properties of the raster data to be created as well as the properties of the storage container. In an ArcSDE geodatabase, raster data is stored as a set of database management system (DBMS) tables that are used to manage the pixel values, pyramids, and other auxiliary information. The pixels of raster data are divided into small tiles, and each tile is stored as a binary large object (BLOB) in a row of the block table. The raster column in the business table defines the properties of the raster dataset, and the geometry column defines properties of the footprint of the raster dataset. A file geodatabase raster has a similar implementation as an ArcSDE geodatabase. The only difference is that raster data is stored as a set of file geodatabase tables in the file system instead of in a relational geodatabase. IRasterWorkspaceEx is used to create a raster dataset and a raster catalog in a geodatabase. When creating data in a geodatabase, RasterDef can be used to set the properties of the raster field, and RasterStorageDef can be used to specify the storage properties such as tile size, cell size, pyramid origin, and compression. Because raster data in a personal geodatabase is implemented by converting it to an IMAGINE file format and managing it in the personal geodatabase, only some of the raster storage properties apply to a personal geodatabase (such as cell size and compression). Creating a geodatabase raster dataset using IRasterWorkspaceEx initially creates an empty raster dataset, which servers as a placeholder for the specified properties of the raster dataset. The extent and pixel values of the dataset can be populated by mosaicking from other raster dataset or, alternatively, writing using PixelBlock. As a type of dataset, RasterDataset performs basic dataset management functions such as copy, rename, and delete. It can also be used to examine dataset properties, such as raster format and compression type by using the IRasterDataset interface. A RasterDataset is a type of geodataset and supports the IGeoDataset and IGeoDataset2 interfaces. A RasterDataset has an extent, a spatial reference, and a geodata transformation (GeodataXform). The geodata transformation is used to transform the pixels geometrically. Normally, a raster dataset has an IdentityXform, which does not change the extent and spatial reference of the data. In some cases, a raster dataset can contain a non-IdentityXform, for example a raster dataset created from the IRasterGeometryProc.Register method (using the Georeferencing tool's Update in ArcMap) contains a PolynomialXform, which stores the transformation added to the raster dataset. //Get the native spatial reference. 'Get the native spatial reference. The spatial reference and the geodata transformation of a raster dataset can be altered using the IGeoDatasetSchemaEdit2 interface. The IRasterDatasetEdit3 interface is used to work with the raster attribute table, color maps, statistics, and histograms. You can build, add, and delete the properties of a RasterDataset. You can also merge pixels from another raster dataset to the current raster dataset through the IRasterDatasetEdit3.Mosaic method. The IRasterPyramid3 interface is used for creating raster pyramids. You can build pyramids for a specified pyramid level and a specified resampling method. A RasterDataset is composed of one or more persistent raster bands. You can get a RasterBand through the IRasterBandCollection.Item method. Other methods of the IRasterBandCollection interface, such as Add or Remove, have no effect on the RasterDataset. IRasterBandCollection.SaveAs produces the same result as ISaveAs.SaveAs. 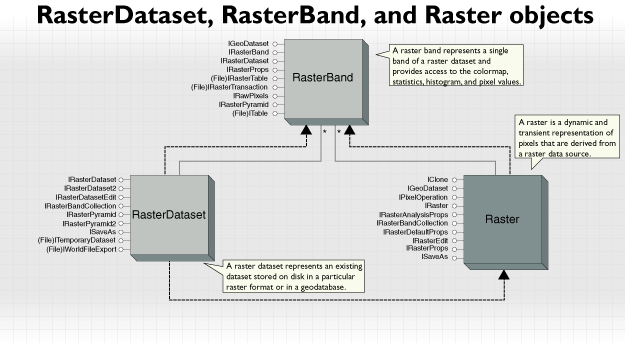 The RasterBand class represents an existing band of a raster dataset. You can access a RasterBand of a Raster or a RasterDataset. Regardless of whether it is derived from the static RasterDataset or the transient Raster, the RasterBand always represents a static band of raster data. A raster band contains pixel values, which can be accessed through the IRawPixels interface or through the Raster class using the IRasterEdit interface. The properties of the IRasterProps interface on RasterBand supports read only with the exception of NoDataValue, which is used in writing pixel blocks. A file-based RasterBand also supports the IRasterTransaction interface, which is used to manage the pixel editing transaction. A raster attribute table is a generic table that stores pixel information, such as soil type and land use type. A raster attribute table is stored as a .dbf file (with the same name as the dataset) for file-based raster data, as a value attribute table (VAT) for a grid, and as an internal table for raster data in geodatabases. The RasterHistogram class represents the histogram information of the pixel values of a raster band. It is not creatable and can be retrieved from a RasterBand using the IRasterBand.Histogram property. The RasterColormap class contains a collection of colors that are represented in an RGB form. It can be created by loading from a .clr file or defining the R, G, and B colors using the IRasterColormap3 interface. A RasterColormap can be retrieved from a RasterBand using IRasterBand.Colormap, or retrieved from a Raster using IRaster2.Colormap. You can also set the color map of a dataset through the IRasterDatasetEdit interface. The Raster class, in contrast to the static RasterDataset and RasterBand classes, is transient in nature and can be modified without affecting the source data. This allows the raster to represent what you want - for example, you can set a transformation or a pixel filter on a raster, specify a projection or extent, and set other properties without changing the raster dataset. If you want to persist change, the modified raster can be saved to another raster dataset using the ISaveAs interface. Although Raster is always transient in nature, it must be associated with one or more raster bands, which provides a source for the data to be read through the raster. As such, the Raster is most easily understood as a vehicle to provide resampling, transformation, and data type conversion from one or more raster bands to a desired output coordinate system. The IRasterDataset2.CreateFullRaster method creates a raster with all the properties from the raster dataset, such as number of bands and width and height of the raster dataset. The IRasterDataset.CreateDefaultRaster method creates a raster that has a square cell size and contains only three raster bands even if the dataset has more than three bands. The three bands are the default bands used in the raster RGB renderer and are determined by the settings for default raster behavior made on the RasterDefaultsEnv class in the Carto library. //Create a raster with all bands. 'Create a raster with all bands. A raster can be obtained from the RasterLayer class in the Carto library. //Create an empty raster and append bands. 'Create an empty raster and append bands. IRasterProps is used to get and set the properties of the raster, such as extent, width, height, spatial reference, pixel type, and NoData value. Resampling occurs when the raster is changed geometrically, such as setting an extent, a spatial reference, or a geodata transformation. In this case, the IRaster.ResampleMethod property can be used to specify the resampling method, and it will be applied during SaveAs or during raster display. The following code projects the raster by setting a new spatial reference and calling SaveAs. To project a raster with a specified datum transformation, use IRaster2.GeoTransformations. You can get the cell size of a raster. However, setting a cell size for a raster should be done by adjusting the width, height, and extent of the raster. If the height and/or width are changed, the cell size of the raster will be recalculated using the new height and width to divide the current raster extent. In this case, it will most likely result in a raster with non-square cell size. To use SaveAs on a raster with square cell size, specify a precalculated height and width. //Get the extent and cell size of the raster. //Transform the cell size first, then the extent. The sequence matters. //Put the transformed extent and cell size on the raster. 'Get the extent and cell size of the raster. 'Transform the cell size first, then the extent. The sequence matters. 'Put the transformed extent and cell size on the raster. //Set the filter to the raster. 'Set the filter to the raster. The pixel values of the raster can be modified and written directly to the raster bands of the raster dataset using the IRasterEdit interface. A raster can be displayed using the RasterLayer class and various raster renderer objects in the Carto library. The PixelBlock class is a container for pixel arrays. It has the properties of width, height, pixel type, and number of planes. Each plane is a pixel array corresponding to one raster band. The PixelBlock class can handle generic pixel arrays from any raster data source. To support different pixel types, PixelBlock transports pixels in a SafeArray, which can contain many different data types. //Create a pixel block using the size provided by the system. //Read the first pixel block. //(assume the raster has a pixel type of uchar). //Write the modified pixel block to the raster dataset. 'Create a pixel block using the size provided by the system. 'Read the first pixel block. '(assume the raster has a pixel type of uchar). 'Write the modified pixel block to the raster dataset. For a small raster dataset, the size of the pixel block can be the size of the entire dataset, which can usually be held in memory at one time. When working with a large amount of raster data, the best practice is to divide the raster into small pixel blocks and perform reading and writing pixels block by block using the RasterCursor class. The IRaster.CreateCursor method provides a simple way to create a RasterCursor based on a pixel block that has the width of the whole raster and a height of 128. The IRaster2.CreateCursorEx method allows you to create a raster cursor with a user-specified pixel block size or system-provided pixel block size (pass nothing to the pixel block size). Pixels, or cells, in a raster dataset that are missing information are called NoData. For a file-based raster dataset, NoData is stored as a value, called NoData value, in the raster dataset. The pixels that have the same value as the NoData value are NoData pixels. For a database raster dataset, NoData pixels are stored as a bit mask - a two-dimensional array of 0s and 1s, where 0 represents that the corresponding pixel is a NoData pixel. IRasterProps.NoDataValue can be used to get and set the NoData value on a raster. The NoData value is used in saving (SaveAs) to a new dataset. //Or set a different NoData value for each band. 'Or set a different NoData value for each band. RasterCatalog, a special type of FeatureClass in geodatabases, manages a collection of raster datasets as one entity. It has a Name field that stores the name of the raster dataset, a Geometry field that stores the footprint (bounding box) of the raster dataset, and a Raster field that stores the pixel values of the raster dataset. It can also contain other fields, such as metadata, text, and so on. Only one Raster field is allowed in a raster catalog. The Raster field of a raster catalog has a spatial reference, defined by RasterDef, which serves as a default for loading raster datasets that have unknown spatial reference. In ArcGIS, the raster datasets in a raster catalog are allowed to store their own spatial references and geodata transformations. In addition to defining the spatial reference for the raster field, RasterDef also defines how the raster values are managed in the raster catalog. A managed raster catalog stores raster values in the raster catalog. An unmanaged raster catalog stores only the paths to the raster datasets, and those raster datasets may reside in a file system. A raster catalog in an enterprise geodatabase is always managed. The footprints of the raster datasets stored in the Geometry field are automatically managed, populated, and spatially indexed by the geodatabase. The spatial reference (the projected or geographic coordinate system, the coordinate domain, and the coordinate precision) and the spatial index of the geometry field can be set using the GeometryDef class. The value stored in the Raster field is called a RasterValue. A RasterValue contains a RasterDataset and a RasterStorageDef that describes how the RasterDataset is stored in the geodatabase. You can specify the tile size, cell size, and origin of the raster dataset. You can also define the compression type as well as the resampling method for pyramid building. As a subclass of FeatureClass, RasterCatalog consists of rows. Each row is a RasterCatalogItem, which is a type of Feature. A RasterCatalog operates the same way as a FeatureClass when accessing or updating the raster datasets in the RasterCatalog (for example, enumeration of the raster datasets in a RasterCatalog is accomplished by acquiring a standard FeatureCursor on the RasterCatalog). Insert and update can be achieved by an insert cursor or an update cursor. A RasterCatalog can be displayed using the GdbRasterCatalogLayer class in the Carto library. A function raster dataset encapsulates a raster function, which defines a raster operation, and the data on which it operates. As a special type of raster dataset, a function raster dataset provides a mechanism for on-the-fly raster processing by binding a raster function and its arguments together. For example, a function raster dataset may contain a hillshade function with its corresponding arguments, which include an input digital elevation model (DEM), altitude, azimuth, and z factor. When accessed, the raster function in the function raster dataset is evaluated, providing a virtual hillshade of the DEM. A raster function defines an operation that operates on raster data. The RasterFunction class is an abstract class (from which many concrete classes - including PansharpeningFunction, ArithmeticFunction, and HillshadeFunction - are derived), which define various raster operations. The RasterFunctionArguments class is an abstract class used to define the parameters of its corresponding raster function and has many concrete raster function arguments classes derived from it. Some raster functions can be used directly. However, most raster functions have a corresponding RasterFunctionArguments class for defining their arguments. For example, the arguments of the PansharpeningFunction are defined by PansharpeningFunctionArguments, the arguments of ArithmeticFunction are defined by ArithmeticFunctionArguments, and the arguments of HillshadeFunction are defined by HillshadeFunctionArguments. The RasterFunctionTemplate class is used to define a raster function for which the parameters are variables. For example, a CompositeBandFunction can have any number of bands as input. The RasterFunctionTemplate can be used to define a CompositeBandFunction from a given number of bands using RasterFunctionVariable objects. Raster functions can also be customized. The RasterFunction abstract class can be extended by implementing a new concrete class to perform processing that is not included with the software. For information on how to create a custom raster function, see Function raster datasets and raster functions. 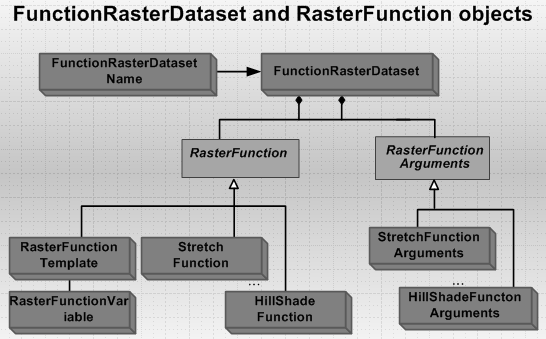 A function raster dataset is a virtual raster that represents the application of a raster function on raster data. The FunctionRasterDataset class contains a RasterFunction and its associated RasterFunctionArguments. The IFunctionRasterDataset interface provides a way to instantiate a function raster dataset and obtain the RasterFunction, RasterFunctionArguments, and RasterInfo from the function raster dataset. //Create a function raster dataset name. //Set the name string and open the function raster dataset. 'Create a function raster dataset name. 'Set the name string and open the function raster dataset. As a special type of raster dataset, the FunctionRasterDataset class inherits interfaces from RasterDataset, such as IRasterDataset, IRasterbandCollection, and ITemporaryDataset. The function raster dataset is temporary when initially created using the Init method. It is removed automatically if the application goes out of scope. To persist it, the ITemporaryDataset interface can be used. In addition, to save the function raster dataset as a raster dataset, use the IRasterDataset interface to obtain a RasterDataset, then use ISaveAs.SaveAs. //Create a function raster dataset. //Define a name for the function raster dataset.
' Create a function raster dataset.
' Define a name for the function raster dataset. The mosaic catalog has a list of predefined fields - such as MinPS, MaxPS, LowPS, and MaxPS - and a raster field of type Function. This special type of raster field allows the storage of function raster datasets, which are the foundation of on-the-fly processing. The rows in the mosaic catalog are populated with information obtained from these function raster datasets, which are created from the source data based on the raster type that was specified when the dated was added. The MinPS and MaxPS fields store pixel sizes that define display ranges for the rasters stored in the mosaic catalog. When a request is made at a certain pixel resolution, only rasters with pixel ranges matching the requested pixel resolution are selected and mosaicked on the fly. Overviews are raster tiles generated at user-defined resolutions to make the display faster. 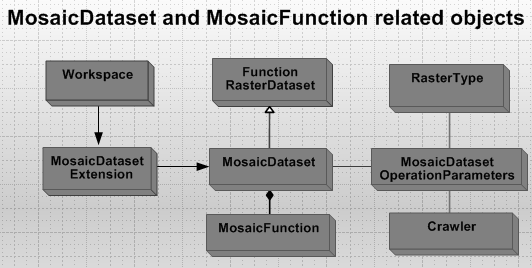 The MosaicDataset object is a special type of FunctionRasterDataset. It contains a mosaic function. MosaicDataset can be accessed through the IMosaicWorkspaceExtension interface. The IMosaicDataset interface provides access to the MosaicDataset, arguments, and the various components of the mosaic dataset including the boundary, catalog, and seamline table. // Create the mosaic dataset creation parameters object. // Set the number of bands for the mosaic dataset. // Set the pixel type of the mosaic dataset. // Create the mosaic workspace extension helper class. // Find the right extension from the workspace. // spatial reference and the creation parameters object created above.
' Create the mosaic dataset creation parameters object.
' Set the number of bands for the mosaic dataset.
' Set the pixel type of the mosaic dataset.
' Create the mosaic workspace extension helper class.
' Find the right extension from the workspace.
' spatial reference and the creation parameters object created above. A mosaic dataset can reference an external raster catalog or another mosaic dataset. This type of mosaic dataset is called a referenced mosaic dataset. For example, a raster catalog cannot be published by ArcGIS Server directly; however, a referenced mosaic dataset can be created from the raster catalog and published. A mosaic dataset that references another mosaic dataset can be created. This allows mosaic datasets to be a data management solution, with referenced mosaic datasets created to provide multiple views of the same data. For example, you can put your data - such as a Landsat of the world - in one mosaic dataset, then use referenced mosaic datasets to view and distribute portions of the data or different band combinations. When creating a referenced mosaic dataset from a raster catalog, a predefined maximum visible size is used as a threshold to determine what is displayed: a rasterized wireframe or a dynamically mosaicked image. A referenced mosaic dataset can also be created from an ArcGIS Military Analyst raster catalog, where the display ranges of the rasters in the mosaic dataset are determined by the scales defined in one of the fields in the raster catalog. To create a referenced mosaic dataset from an existing mosaic dataset, the MinPS and MaxPS fields can be used to define display behavior. For information on how to create a referenced mosaic dataset from different sources, see How to create a referenced mosaic dataset. The IMosaicFunction interface provides access to properties and methods that define the mosaic process. The WhereClause and Search properties are used to select rasters that participate in the mosaic. The MosaicMethod property specifies the order in which the rasters are mosaicked. MosaicOperator is used to resolve the overlapping pixels. The following table lists the supported mosaic methods and operations. Not all mosaic operations apply to all mosaic methods. Selects only the rasters in a given list of raster IDs to participate in the mosaic. This method takes LockRasterIDs as a parameter, which defines the list. The rasters are in random order. The rasters are visible at all pixel sizes regardless of the minimum and maximum pixel size range of the locked rasters. Sorts rasters based on the distance between the nadir position and view center. This is similar to the esriMosaicCenter method but uses the nadir point to a raster, which can be different than the center, especially for oblique imagery. Sorts rasters based on a user-defined view point location and nadir location for the rasters. Cuts the raster using a predefined seamline shape for each raster using optional feathering along the seams. Ordering is defined in the SOrder field in the footprint table during seamline generation. There are also many properties that are used to define pixel visibility. For example, use MaximumVisibleCellsize if the mosaic dataset is referenced and created from a regular raster catalog; use LODInfos if the mosaic dataset is created from an ArcGIS Military Analyst raster catalog; and use MinCellSizeName and MaxCellSizeName if a referenced mosaic dataset is created from another mosaic dataset. The IMosaicDatasetOperation interface is used to perform operations on the mosaic dataset, for example, adding rasters to a mosaic dataset, building boundaries, calculating cell size ranges, and building overviews. The parameters for each operation are defined using a corresponding operation parameters class. For example, the AddRastersParameters class defines parameters required for adding rasters including crawler and raster type. ArcGIS currently supports many raster types including: Raster dataset, Landsat, QuickBird, SPOT5, IKONOS, WorldView-1, WorldView-2, GeoEye-1, LAS, Radarsat2, and so on. Any ArcGIS-supported raster format can be added to a mosaic dataset using the Raster Dataset raster type. To add Landsat MS data to a mosaic dataset, use a Landsat raster type. A RasterType class contains a RasterBuilder and an ItemTemplateArray. RasterBuilder uses the output from the crawler and builds items that are then converted to function rasters using the templates defined in the ItemTemplateArray. RasterBuilder is an abstract class that has many concrete builder classes derived from it, such as LandsatBuilder, SpotBuilder, and IkonosBuilder. RasterBuilder constructs one or more BuilderItem objects from the crawled data. Each builder item corresponds to a FunctionRasterDataset that has an Item Uniform Resource Identifier (ItemURI). For example, LandsatBuilder constructs an item of a panchromatic function raster dataset and an item of a multiband function raster dataset from one Landsat scene, then RasterType creates a multiband raster and a pan-sharpening raster from these items using ItemTemplateArray and adds them as rows in the mosaic raster catalog. RasterType can be instantiated though the RasterTypeEnvrionment class. To load rasters to a mosaic dataset, a raster type must be used in the AddRastersParameters object. For information on adding rasters to a mosaic dataset, see How to add rasters to a Mosaic dataset. The raster type class can be customized. You can add a custom raster type by creating a custom raster builder and saving it as a raster type file (.art). For information on adding a custom raster type, see Create a custom raster type. A geodata transformation is a mathematical operation that is used to perform geometric transformations for geodatasets such as raster datasets. ArcGIS supports many geodata transformations, such as coordinate transformation (reprojection), polynomial transformation, rubber sheeting (Adjust) transformation, Spline transformation, and RPC transformation. All GeodataXform objects can have an output spatial reference that defines the spatial reference of the data after transformation (for example, in output space). The domains of GeodataXform objects, if they exist, are also defined in the output space. All GeodataXform objects perform point (IPointCollection or WKSPoint) transformation, extent (IEnvelope) transformation, and cell size transformation in forward and backward directions. To transform raster data, the RasterXformer object (discussed at the end of this section) provides the behind-the-scenes mechanism by calling PixelReader, PixelResampler, and IRasterXform. The IRasterXform interface is used for geodata transformations that need raster-specific information to optimize operations. Therefore, when creating a custom geodata transformation to work with raster data, implement the IRasterXform interface. The following code example transforms a collection of points. The point collection, extent, and cell size are transformed by reference - for example, the input and output use the same variable. A GeodataXform object is stored as metadata of the raster dataset and can be modified using IGeodataSchemaEdit2.AlterGeodataTransformation. The GeodataXform of a raster dataset will be applied to transform the pixels on the fly during raster layer display. You can also set GeodataXform on a raster and persist the transformed raster using ISaveAs. Saving as a RasterDataset will not apply the GeodataXform to the pixels but will persist the GeodataXform with the output raster dataset. The PolynomialXform object performs transformation using a polynomial, which is built based on a least squares fitting (LSF) algorithm. A PolynomialXform can be defined in two ways. One is to use two sets of control points - source and target - to construct the polynomial of an order of 1, 2, or 3. The minimum number of non-correlated control points required for this method must be 3, 6, and 10, respectively. The second way is to set the polynomial coefficients directly using the IPolynomialXform.DefineFromCoefficients method if the polynomial coefficients are known. The SplineXform class performs a geodata transformation using a spline function, a piecewise polynomial that maintains continuity and smoothness between adjacent polynomials. It transforms the source control points exactly to the target control points, while the points or pixels that are away from the control points are not always guaranteed to have higher accuracy. Spline transformation is useful when the control points are important and required to be registered precisely. Adding more control points can increase the overall accuracy of the Spline transformation. A SplineXform can be created from two sets of control points using the DefineFromControlPoints method of the ISplineXform interface. //Create AdjustXform using control points. //Use interpolation to perform the adjustment. 'Create AdjustXform using control points. 'Use interpolation to perform the adjustment. //Create CoordinateXform and set the spatial reference. //Ensure unit is in the input space. 'Create CoordinateXform and set the spatial reference. 'Ensure unit is in the input space. Some image products delivered from satellite image companies such as Digital Globe or Space Imaging contain RPC information in the image data. The RPC, represented as 92 parameters, defines the transformation to be used for image registration. The RPCXform class is used to support RPC transformation and image orthorectification. When creating an RPCXform, in addition to setting the 92 coefficients using IRPCXform, you must also set the forward transformation since RPC only defines the reverse transformation (ground to image). The ISensorXform interface is used to set the elevation information to perform image orthorectification. GCSShiftXform is used to perform transformation from a non-standard GCS coordinate (0 to 360) to a standard GCS ( - 180 to 180). For example, if your world image is in a coordinate system of (0, 360, -90 , 90), GCSShiftXform can be used to transform the image to (-180, 180, -90, 90). FrameXform is used to support standard frame camera model transformation. GeometricXform is a geodata transformation based on the transformation classes defined in the Geometry library (for example, AffineTransformation2D and ProjectiveTransformation2D). It is a wrapper of these classes and allows these classes to be incorporated in the geodata transformation pipeline. IdentityXform is an identity coordinate transformation that has no effect on coordinates and is used solely to associate or change the spatial reference of the data. A raster dataset created from IRasterGeometryProc.Rectify has an identity transformation, while a raster dataset created from IRasterGeometryProc.Register has a polynomial transformation. CompositeXform consists of a set of ordered Xforms and is used to manage the Xform list - for example, to add or remove a GeodataXform. The sequence of the applied transformation is from bottom to top for forward transformation, and top to bottom for reverse transformation. To transform raster data with geodata Xforms, the RasterXformer class plays a behind-the-scenes role. RasterXformer contains a GeodataXform, a PixelResampler, and a PixelReader, as well as the logic to drive these three components to perform raster transformations. Raster transformation is a reverse transformation. For a given extent (Envelope for example) in the output space, RasterXformer first rasterizes it into pixels, then reverse transforms the pixels into the input space using GeodataXform. Finally it resamples the pixels provided by PixelReader in the input space using PixelResampler. If an approximation is used in the transformation, only pixels on a predefined mesh are reversely transformed to the input space, and the values of the pixels inside the mesh are interpolated. The default pixel reader used by RasterXformer is SimplePixelReader, and it provides input pixels, either from a raster or from raw pixels read by implementing a call back function using the IRawPixelReader interface. If the input pixels are not from a raster, IRasterXformer2 can be used to dynamically transform pixels, such as on-the-fly projected pixels from an ArcIMS layer. In this case, you are responsible for setting up a custom PixelReader. //Set the resampling method and factor (-3, 0). 'Set the resampling method and factor (-3, 0). The PixelFilterCollection class allows you to define more than one pixel filter operation on a pixel block. You can also create a custom filter by implementing the IPixelFilter interface. The PansharpeningFilter class is used to perform image enhancement using various panchromatic sharpening techniques. Panchromatic sharpening uses a higher-resolution panchromatic image (or raster band) to fuse with a coregistered lower-resolution multiband raster dataset. The result of this produces a multiband raster dataset with the resolution of the panchromatic raster where the two rasters fully overlap. IPansharpeningFilter is used to create a PansharpeningFilter class, setting a panchromatic raster and specifying a pan-sharpening type. In this model, RW, GW, BW, and IW (>0) are weights for red, green, blue, and infrared components. P, R, G, B, and I (as well as P', R', G', I') represent the input and output pixel values of the panchromatic, red, green, blue and infrared bands respectively. At ArcGIS 10.1, automatic image-to-image matching and image registration of a collection of images are supported. The primary class used to perform these two operations is ImageRegistration. You can match an image to a reference image using the ImageRegistration and RasterGeometryProc classes. The following code example automatically georeferences an image to a reference image. It first computes the match points of the two images (assuming the two images have overlaps) using the ImageRegistration class, then uses the computed matching points as control points for RasterGeometryProc. //Compute the matching points from the overlapped images. //Prepare source and target points from the matching points. //Use RasterGeometryProc to perform georeferencing using source and target control points. 'Compute the matching points from the overlapped images. 'Prepare source and target points from the matching points. 'Use RasterGeometryProc to perform georeferencing using source and target control points. Image registration operates on a mosaic dataset, so a mosaic dataset must be created from the collection of images before the image registration operation. Image registration can work with any type of ortho or sensor image as long as the image is supported by raster types, and as long as the images in the mosaic dataset have overlaps. Create the feature point table from the input mosaic dataset. create tie points from the feature point table. Compute links from the tie points. Apply the solution to the mosaic dataset if the estimated error is acceptable. //Get the spatial reference for creating control points and feature points. //Prepare the feature point table for feature point extraction. //Prepare the control point table for calculating control points. //Prepare the solution table for cauclating adjustment. //Compute feature points from the input mosaic dataset. //Compute tie points from the feature point table. //Compute links from the tie point. //Compute adjustment from the mosaic dataset using the computed links. //If the RMS is acceptable, apply the adjustment to the mosaic dataset. The Mensuration class is used to measure building height, length, area, and location from a single image. The Mensuration class takes a raster and outputs a measurement result class, such as HeightResult, PerimeterResult, or AreaResult, depending on the type of measurement requested. These classes contain the value of the measurement as well as the value of the corresponding uncertainty. The minimum requirement for using the Mensuration class is that the input raster must have a spatial reference. Additionally, when measuring building height, the input raster must contain a camera model (RPCXform, FrameXform, and so on), as well as sun information (angle and azimuth) if measured with shadow is needed. //Define the mensuration class and set the input. 'Define the mensuration class and set the input. This section includes classes used for mosaicking raster datasets, loading raster datasets and raster catalogs, as well as conversion. It also contains other miscellaneous objects. The MosaicRaster and RasterLoader classes are used to mosaic raster data. MosaicRaster mosaics a collection of raster datasets and saves the result to a new seamless raster dataset. MosaicRaster also takes a raster catalog as an input and mosaics all raster datasets, or a portion of the raster datasets in a raster catalog defined by a Where clause, into a single raster dataset. You can control how the overlapped pixels are resolved by specifying MosaicOperatorType or by creating a custom operator by implementing the MosaicOperator class. You can also control the output color map for mosaicking color mapped raster datasets. //Mosaic a raster catalog with a Where clause. 'Mosaic a raster catalog with a Where clause. The RasterLoader class is used to mosaic raster data, in any format, to an existing raster dataset. This method works if the existing raster datasets are in a supported writable format, but it works best for ArcSDE or file geodatabase raster datasets. RasterLoader allows you to specify certain properties during data loading such as background value to be ignored or the output color map. This class extends the functionality of IRasterDatasetEdit.Mosaic by allowing you to specify additional properties for the mosaicking operation. The IRasterLoader interface allows you to specify certain ways to load raster data into an existing raster dataset. MosaicColormapMode sets the operation mode for color map manipulation. Background sets the background value of the input raster to be ignored when loading. Foreground, when set to 255, instructs the loader to load a 1 bit raster into an 8 bit raster dataset for better display effect. PixelAlignmentTolerance sets the tolerance for resampling. Two loader classes are available in ArcGIS to facilitate raster catalog loading - RasterCatalogLoader and DrLoader (distributed raster catalog loader). RasterCatalogLoader is a class for loading a set of raster datasets or a directory of raster datasets to a geodatabase raster catalog. Since ArcGIS supports persisting transformation with raster datasets in a raster catalog, and allows the spatial references of the raster datasets to be different from the spatial reference of the raster column, the IRasterCatalogLoader interface can be used to load these raster datasets into a geodatabase raster catalog and apply the transformation, re-project to the output dataset during the loading or persisting of the transformation, spatially reference the properties of the raster dataset, or any combination of these options. Assuming a directory contains images of universal transverse Mercator (UTM) Zone 16 and UTM Zone 17, the following code loads those images to a raster catalog by preserving their original spatial reference. Setting projected to true will project the images to the spatial reference defined in the raster field. When creating a raster catalog of RPC images, you can set IRasterCatalogLoader.Transformed to false to persist RPCXform with the raster datasets during the loading. DrLoader is used to load raster datasets or a directory of raster datasets to a raster catalog. It is designed for the ArcGIS Server environment where there are multiple containers. DrLoader distributes the loading tasks to all the worker machines to reduce loading time through parallel loading. The RasterGeometryProc class is used to perform polynomial transformations such as flip, rotate, and warp. It can also project rasters from one spatial reference to another. RasterGeometryProc is built based on the PolynomialXform class but provides easy to use methods for end users. RasterGeometryProc manipulates only the Raster class, not RasterBand nor RasterDataset. This is because the Raster is transient, as are the effects of the RasterGeometryProc. This means that any transformation disappears when the raster goes out of scope. The ProjectFast method projects a raster to a new projection with a specified cell size. In ArcGIS, raster projection is built on a point-to-point approximation algorithm that performs fast and accurate re-projection of raster data. The algorithm projects pixels on a predefined 16x16 mesh using a point-to-point projection. It then transforms the pixels inside the mesh using a bilinear interpolation technique if the error on a sub-mesh is within a tolerance of a half pixel, otherwise it projects the remaining pixels using a point-to-point projection. Since pixels on a sub-mesh are projected using point-to-point projection during the estimation of the interpolation accuracy, the algorithm performs point-to-point projection on a finer grid mesh and results in a higher accuracy than the default half-pixel tolerance. When more than one domain is involved in a raster dataset, such as a raster dataset with Cube projection, Fuller projection, or projection with non-zero central meridian, the algorithm will divide the output space into contiguous domains by overlaying input and output domains and project pixels in each domain. This algorithm maintains the integrity of the raster dataset and guarantees that there is no discontinuity in the output raster dataset. The RasterColormapToRGBConverter class is used to convert between a raster dataset that contains a color map and a three-band raster dataset. RasterCatalogTable is a legacy class used to represent a table-based raster catalog, and SdeRasterCatalogTable is used for ArcGIS 8.x style raster catalogs. The RasterDomainExtractor class extracts a polygon boundary from a raster, along the borders of pixels that are not NoData (value pixels). RasterPicture can load a raster into a Picture control. UniqueValues, StatsHistogram, RasterCalcStatsHistogram, and RasterCalcUniqueValues are helper classes for raster renderers, which are in the Carto library. DERasterDataset, DERasterBand, and other data element classes are used in geoprocessing scripting language.